Acute conjunctivitis – more commonly known as “pink eye” – affects nearly 6.9 million people in the United States every year.1 Approximately 1 in 4 patients with acute conjunctivitis have confirmed adenoviral conjunctivitis.2,3 QuickVue Adenoviral conjunctivits Test is the first and only CLIA-waived, point-of-care test that detects all known serotypes of adenoviral conjunctivitis. Early and accurate diagnosis of pink eye may prevent serious consequences including morbidity. 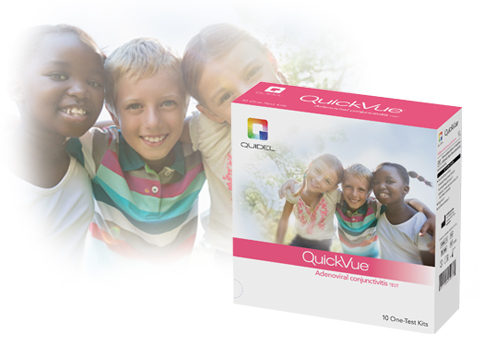 Significant overlap exists in the clinical signs and symptoms of acute conjunctivitis and misdiagnosis by eye care professionals occurs in approximately 50% of conjunctivitis cases.4 With QuickVue Adenoviral conjunctivits Test you can make a rapid, accurate diagnosis before the patient leaves your office. For information on additional eye health products, visit QuidelEyeHealth.com. 1 Thomson Reuters Medstat Marketscan Data, 2005. 2 Sambursky R, Trattler W, Tauber S, et al. Sensitivity and specificity of the AdenoPlus test for diagnosing adenoviral conjunctivitis. JAMA Ophthalmol. 2013;131:17-22. 3 Sambursky R, Tauber S, Schirra F, et al. The RPS Adeno Detector for diagnosing adenoviral conjunctivitis. Ophthalmology. 2006 Oct;113(10):1758-64.